What is a Wok Burner? Why Use a Wok With a Round Bottom? Can I Use a Wok Ring on an Gas Range? What Kind of Wok is Best for an Electric Stove? What is the Best Oil to Use With a Wok? How to Season a Wok That Actually Works! Why Use a Wok With A Flat Bottom? Blog What Kind of Wok is Best for an Electric Stove? The flat-bottomed wok is generally best for an electric stove. There are two types of electric stoves you could use with your wok. The first stove is an electric coil stove and the second type of electric stove is the glass -ceramic top stove. Usually, the electric coil stove is older technology and often is found in apartments. The glass-ceramic top stoves are more expensive and easy to clean but can scratch or break easily. With the electric coil stove, the wok with a flat bottom can be placed right on top of the heating coils. With the glass-ceramic stove, you can do the same or use a wok ring; however, there are other considerations to address. The main point to remember when you are cooking with a wok is that it needs to be hot, really hot. Although you need your wok to be hot, it is necessary to pre-heat the wok and bring the temperature up gradually. This will help prevent warping of your carbon steel wok. This is an excellent practice to follow when using any carbon steel cookware. If you are going to use an electric stove for using your wok, then the following questions are essential. Should I Use a Round Bottom or Flat Bottom Wok? What Kind of Electric Stove Can I Use With my Wok? How Hot Should I Make my Burners Under the Wok? Can I Use a Wok Ring With an Electric Stove? How Hot Does an Electric Stove Get? How Hot Does an Electric Ceramic Stovetop Get? How Hot Does an Electric Coil Stovetop Get? Should I use a Round Bottom or Flat Bottom Wok on an Electric Stove? Using a flat-bottomed wok is preferable over a round-bottomed wok. With a flat-bottomed wok, you want the carbon steel on the bottom of the wok to be in contact with the electric coil burner. This is applicable for a glass-ceramic top or coiled top burner. You can also use a round-bottomed wok if you use a wok ring. Flat bottomed carbon steel woks are not recommended for glass-ceramic stovetops. The only wok I would safely recommend for a glass ceramic cooktop is the Joyce Chen, pre-seasoned cast iron wok. The bottom is flat, approx. 6″ diameter and will sit flat (which is necessary) on your glass-ceramic stove top. Although they may be called by different brand names, all flat-top cookstoves are made of a glass-ceramic blend rather than being all-ceramic or all-glass. It is this blend of glass and ceramic that lends itself to a surface to cook upon. Each appliance company has a trademarked name for its brand of glass-ceramic. 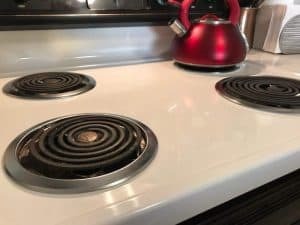 Some stovetops are even made of or called porcelain. As far as function, these cooktops have some qualities of ceramics and some qualities of glass. These smooth tops are formed first as glass, then treated with heat and this causes it to crystallize partially. This process gives the cooktop the expansion capabilities of ceramic without the porous nature of a pure ceramic. These glass-ceramic cooktops are made up of a solid material that handles extreme temperature changes without breaking. The problem is this. It can break if you drop a hard object on it, and can easily scratch if your pan is dragged across the cooking surface. For this reason, these glass-ceramic cooking surfaces are not the best to use a flat-bottomed wok on. No matter how careful you are, your wok will scratch your cooktop. I would not use a carbon steel wok on a glass-ceramic stove top. A cast iron wok would be recommended in this case, even though dropping it is a possibility. The Joyce Chen cast iron wok would be a good choice here. If you use a cast iron wok, you have to be careful not to drop the wok on the glass-ceramic surface because it can crack the surface. Even carbon steel woks can break your cooking surface if it is dropped. If you use a round-bottomed wok, then you will need to use a wok ring. Using a wok ring will help to stabilize your wok. If you try to use a round-bottomed wok on a ceramic top stove it will scratch the glass surface if it is not stabilized. When you use a wok ring, the bottom of the wok does not make contact with the cooking surface. This presents the problem of not being able to get the wok hot enough. Induction stoves would be a better choice over the glass-ceramic or porcelain stovetops. Induction stoves require a high iron content in the pan. Carbon steel pans and woks are 99% iron and 1% carbon which makes them perfect for using a carbon steel cookware. The only drawback is their surface. If you drop a carbon steel wok or cast iron wok on them, the top will crack, so be careful. Do not use a wok ring when using an induction stove. How Hot Should I Make my Burners Under my Wok? If you are using either porcelain (glass-ceramic) top electric stove or a coiled electric stove, make sure you pre-heat your wok slowly. Gradually increase the temperature up to about the 3000-watt level or higher. Do not apply maximum heat to a cold wok or any carbon steel cookware. Doing this could cause your wok or pan to warp. If you are using a cast iron wok, the same heating principles hold. Cast iron can also warp under certain conditions. The trick here is to bring up the temperature slowly. Putting maximum heat under a cold pan or wok will promote warping. Yes. You can use a wok ring on an electric stove. If you only have a round-bottomed wok, then you will have to use a wok ring to stabilized the wok. However, I would not use either a round-bottomed carbon steel wok or flat-bottomed carbon steel wok on a glass-ceramic stove top. I would never recommend a wok ring to be used on an electric stove. If you are using an electric coiled stove top, then I would recommend a flat-bottomed wok. A wok ring won’t physically fit too well on top of the coils, so I would not support the use of a wok ring on an electric coil stove. How Hot Does an Electric Glass-Ceramic or Porcelain Stove Get? Some ovens have a low simmer setting that will melt cheese, gently simmer sauces and soups or heat up leftovers slowly. Simmer settings generally adjust the temperature of the food in the pot to approximately 140 degrees Fahrenheit. The low setting is ideal for a simmering quicker. Depending on the type of oven it can range around 195 degrees Fahrenheit. The medium setting is ideal for cooking vegetables. It ranges from 210 to 300 degrees Fahrenheit, depending on the type of oven. The high setting will be in the upper range for use with a wok. This high setting ranges from 300 to 500 degrees Fahrenheit. If you are using a glass-ceramic top or porcelain top, remember that these tops heat unevenly and they take a long time to heat up. This is because glass is a poor conductor of heat. A problem common to all electric stoves is slow and uneven heating. 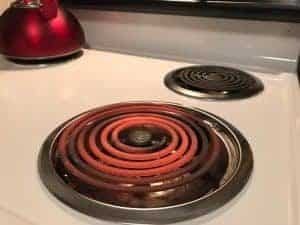 Electric heating elements don’t respond as quickly as gas burners once turned on, so you will have to wait longer to bring your water to a boil. Also, once you do reach the optimum temperature for your meal and have reduced heat, the stove will take longer to lower in temperature. This will be true for coiled as well as glass-ceramic (porcelain) stovetops. Electric coil stove tops are usually rated in wattage. The wattage can range from 100 to 3000 watts. Depending on the model, there will be some burners with different wattage ranges. I recommend only using flat-bottomed woks on electric coil stove tops, making sure they are as flat as possible on the bottom of the wok. I use a gas stove. If I had to use an electric stove, I would limit it to two choices. My first choice would be the electric coil stove top because I can put my flat-bottomed wok directly on the coil heating elements. Another reason is that I would not have to worry about scratching or cracking the top of the burners. My second choice would be to use an induction stove top because they heat the bottom of the wok heats more evenly and quicker because the stove heats on an electrical, magnetic heating principal. The downside is that the surface of the induction cooktop may crack if you drop a cast iron or carbon steel pan on it. Remember that if you use induction cooking that you will need a high iron content in your cookware. Carbon steel cookware is perfect because it has 99% iron and 1% carbon. Cast iron, on the other hand, has about 97-98% iron and 2-3% carbon which is still okay to use with induction cooking. Even though you could use cast iron cookware or woks, I would still prefer to use carbon steel cookware for many reasons. It is lighter in weight, easier to make non-stick and less likely to crack the glass surface of the induction cooking stove. Another reason is that it has a higher iron content than iron which is suited for induction cooking. What is the best material for a wok? The best material for a wok is carbon steel. Traditional Asian woks are all made from carbon steel. Can I use a wok on an induction stove? Woks made from magnetic materials such as cast iron or carbon steel will work great on an induction stove if they have flat bottoms. This site has been a go-to resource for cooking enthusiasts around the world. I have been cooking for over 58 years. 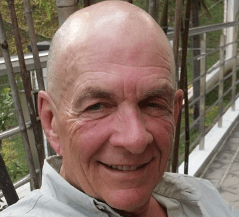 Besides cooking, I am a retired electrical engineer, physician, private detective, and researcher. I had many of the same questions as you when I first started to use a wok. Thank you for visiting my site. I hope you gain some useful information during your visit. _______________________ Award-winning author Grace Young celebrates and demystifies the art of wok cooking for the Western home cook.______________________ Winner of the 2011 James Beard Foundation Award for International Cooking, this is the authoritative guide to stir-frying: the cooking technique that makes less seem like more extends small amounts of food to feed many and makes ingredients their most tender and delicious.________________________ The Wisdom of the Chinese Kitchen, with its 150 recipes culled from a lifetime of family meals and culinary instruction, is much more than a cookbook.